Join us at Lace Up for Kids on November 15, 2018 at UBC Doug Mitchell Thunderbird Arena and make a difference in the lives of BC’s one-of-a-kind kids. On Thursday, November 15, I will be lacing up and skating as many laps as possible at the UBC Doug Mitchell Thunderbird Arena in celebration of the 11th annual Lace Up for Kids. Proceeds from the event will go to BC Children's Hospital Foundation in support of Rare Disease Research. For children affected by a rare disease, research holds the key to finding better treatments and possibly a cure. I am lacing up to make a difference. Please support me and donate to help the physicians, researchers, caregivers, families and friends who are working together to create a brighter, healthier future for children affected by Rare Diseases. 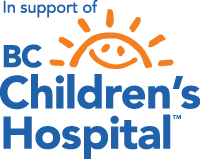 Your contribution means a lot to me and will make a world of difference to the 84,000 children and their families who rely on BC Children’s Hospital each year.